Anyone who wants to learn about 20th century artists needs to know some facts about Pablo Picasso. He was the most celebrated artist of the century, and he created a whole new style of art, called Cubism. Pablo Picasso lived from 1881 to 1973, and during that time he created nearly 50,000 art pieces, including drawings, sculptures, and ceramics. While Picasso worked with many different materials and in many different forms, he is most famous by far for his paintings. Picasso was born in Málaga, Spain. His father was a painter and art teacher at Málaga’s school of fine arts, and Pablo learned figure drawing and still life from him as a child. The family moved from city to city throughout Picasso’s youth, and in each new city, he would join the local art school. Everywhere he went, his work exceeded that of the older students. When he was 13, his father believed that Pablo was now the better painter of the two of them, and gave up art himself. Two years later, Pablo first had a painting featured in an exhibition in Barcelona. All Picasso’s early work was in the traditional, classical style; he didn’t begin to experiment with new forms until he was 19. As an artist, Picasso went through four major phases, called periods. From 1901 to 1904, he painted dark and sad pictures. This period is called the Blue Period, because he used mostly blue and blue-green paints. After that, he began painting happier pictures in orange and pink; this lasted from 1904 until 1906 and is called the Rose Period. From 1907 to 1909, his pictures had an African theme, so this phase is called the African-Influenced Period. These themes should be easy to remember because the names of the periods match the art from the periods very clearly. Finally, from 1909 to 1919, Picasso experimented with Cubism, a new form of art in which the artist looks at the subject of the painting from multiple angles and then displays all angles together. The result is a picture that hints at the original object but doesn’t actually look anything like it. Picasso described his work during the Cubism Period by saying “I paint forms as I think them, not as I see them.” These paintings are almost colorless. Picasso’s Cubist paintings are his most famous; his paintings of women with only one eye and their noses in the wrong places are iconic examples of the style. Picasso was one of the two founders of the Cubist movement (the other was Georges Braque), and his work was so popular that he was a celebrity during his own lifetime, which is very unusual for artists. Picasso’s first word was “piz;” he was trying to say “lapiz,” which means “pencil” in Spanish. Picasso’s full name was Pablo Diego José Francisco de Paula Juan Nepomuceno María de los Remedios Cipriano de la Santísima Trinidad Clito Ruiz Picasso. Picasso lived to age 91. Picasso is considered to be the most famous artist of the 20th century. Along with his paintings, Picasso also did drawings, made sculptures, and even created tapestries. Of all the artists in history, Picasso has had the most paintings stolen. View examples of Picasso’s art at https://www.picasso.com/gallery. 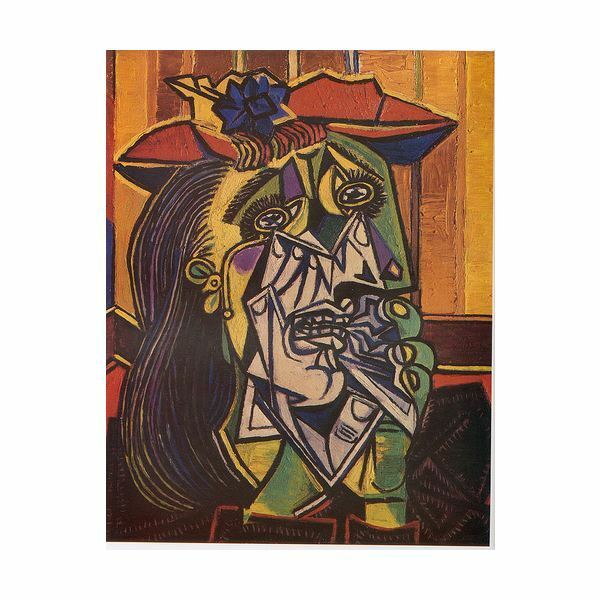 Create your own artwork in Picasso’s cubist style at https://www.picassohead.com. 1. Jones, Judy and Wilson, William. An Incomplete Education. Ballantine Books, 2006. 2. Jones, Jonathan. "I Paint Forms as I Think…" The Guardian. September 4, 2000. 4. Moffat, Charles. "Pablo Picasso – The Most Famous Artist of the 20th Century," https://www.arthistoryarchive.com/arthistory/cubism/Pablo-Picasso.html. 5. Pablo Picasso Facts and Pieces of Art, https://pablopicassofacts.com.